A fantastic set of tools meant to help you ferment 6 gallons or approximately 30 bottles of wine. The Vintner’s Best® Wine Making Equipment Kit contains the tools you need to start making 6 gallon batches of your own wine at home. All you need are the included tools, a corker, empty bottles, and wine ingredients to get started today! In 4-6 weeks you can have up to 30 bottles of your own home made wine to enjoy and share with your friends and family or to cellar. This kit is a fantastic investment if you are ready to try your hand at this wonderful hobby. 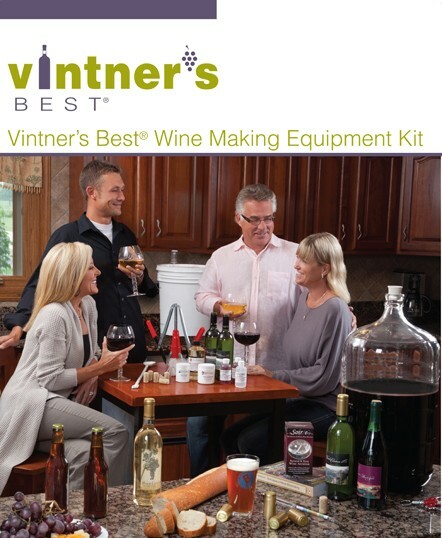 The Vintner’s Best® Equipment Kit contains the following tools: 7.9 Gallon Fermenter and Grommeted Lid, 6 Gallon Glass Carboy, Drilled Rubber Stopper, Econolock, Bottle Brush, Wine Hydrometer, Easy Clean No-Rinse Cleanser, 30 – #8 x 1 ¾ Corks, Fermtech Racking Tube, 5’ Siphon Tubing, Bottle Filler, Plastic Shut Off Valve, and Equipment Instructions.